It was at 3:20 am early Sunday morning when tens of thousands of Bay Area residents woke up to an ominous rumbling under their beds. 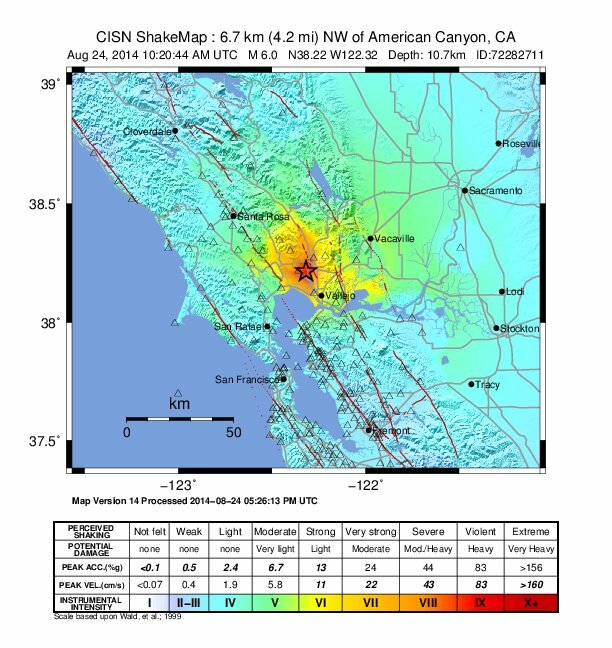 In the deep darkness of the night, the vibrations of the strongest earthquake in the Bay Area since the Loma Prieta Quake of 1989 made their way through our region. They were noticed as far south as Fresno and as far north as Chico. But nowhere else was it felt more strongly than in the City of Napa, and the southern parts of Napa and Sonoma Counties and westernmost Solano County. 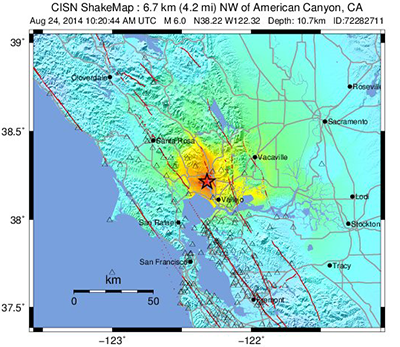 The epicenter of this magnitude 6.0 temblor lay halfway between Napa and Vallejo, almost 7 miles below the Napa County Airport. And strong it was indeed: The seismic station closest to the epicenter registered shaking of almost a half of a "g" at a distance of merely 2 miles, where "g" is the common unit for measuring ground acceleration in terms of the static gravitational g-pull of the Earth itself. In Napa, just 6 miles northwest of the epicenter, the shaking let chimneys and brick facades collapse and glass windows burst. In wine cellars, stores and restaurants thousands of bottles of wine jumped off the shelves, spilling hundreds of gallons of the prized liquid on floors and carpets. Because the earthquake also ruptured gas lines, several fires broke out in Napa - the worst one consumed four trailers in a mobile home park on Orchard Avenue. As of early Sunday morning, almost 90 people were reported injured, mostly with cuts and bruises, but three people were admitted to hospitals in serious condition.